Pours a bright gold with perfect clarity and a finger worth of nice white head that is gone quicker than I can take a picture of it. It smells like spring, fresh cut grass type of thing. Tastes very crisp and refreshing with a small bite of hop bitterness. This is balanced out with some grainy malts. Very medium body with slightly above medium carbonation. I’ve had this beer quite a few times over the years but this is the first time I’ve ever really given it thorough thought and consideration. It served as a rocking session for all my 4th of July activities. Cool, crisp, refreshing, low enough alcohol to keep me from getting smashed and high enough to still ensure a slight buzz. Another great beer from Rivertown getting a 4/5 rating from me. I’ve been getting into lagers more and have become curious about the history of various lagers, many of which seem very similar to others. 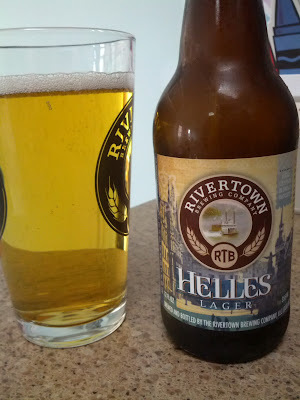 Something to get out of the way first here is that “Helles” (pronounced hell-es or hell-us) means bright/light, nothing to do with Satan, sorry. Also in this case it refers to the color of the beer, not the strength of the alcohol. The origins of this style go back to Munich, Bavaria in what is now southern Germany. Unlike many styles whose history is lost to the sands of time, there is a clear birth date for Munich Helles. The Spaten brewery first poured this out in 1894 and did so to compete with the popularity of Czech Pilsners. They made it a bit more malty and thus a bit more balanced than Pilsners. It was an instant hit and has hung around ever since. While not a home brewer myself I would do a disservice to our readers if I didn’t mention the difficulty in brewing this beer. Getting it just right requires very specific ingredients and a superb attention to detail.